How do I know if my sunscreen is safe and effective? With changes in labeling requirements, SPF values, UVA and UVB protection is still not clear. Many companies have products with SPF ratings over 50, which offer only negligible extra protection and don’t block UVA rays as well. The higher SPF may give a false sense of security and frequent, liberal application is necessary to be effective. Studies have shown chemical based sunscreens containing compounds such as oxybenzone, Ocinoxate, homosalate,, 3BC, and 4 MBC can penetrate the skin, are found in mother’s milk, break down in the sun and may disrupt hormones. Octisalate and octocrylene penetrate the skin and do not disrupt hormones but may cause skin allergies. Some Mineral sunscreens such as titanium dioxide and zinc oxalate provide safer and more effective protection because they don’t penetrate the skin and offer better UVA protection. The downside is that they need to be rubbed in thoroughly to get rid of the chalky look. Apply sunscreen frequently and liberally according to directions on the label using an SPF protection factor of 15-50 and no more. 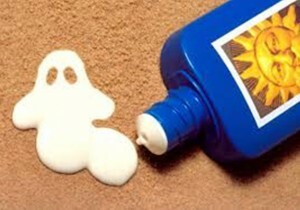 Zinc oxide or titanium dioxide offer the safest and best protection and don’t break down in the sun. Stay on the lookout for better products that are waiting for FDA approval.